The classic peach melba is a dish of skinned peaches served with vanilla ice-cream and raspberry sauce. It was created in the 1890s by the famous French chef Auguste Escoffier, who was then in charge of the kitchens at The Savoy in London. He made it and named it in honour of the Australian opera star, Dame Nellie Melba, whilst she was performing at Covent Garden. It soon took off in fashionable circles as the dessert of the moment and went mainstream not long after. It remains popular to this day. 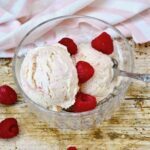 I’ve used the essential ingredients of a peach melba to create this rather sublime peach melba ice cream. Sweet peaches and tart raspberries combine beautifully with just a touch of amaretto to enhance the flavours. Oh! Did I not mention the amaretto? Apparently Escoffier allowed a few almonds to be scattered on top of his famous dessert, but take note, only if they were in season. Almonds weren’t in season when I made this in July, but I reckoned his advice gave me the green light to add a little amaretto to the peach mixture, which I used instead of vanilla. As long as you have a blender or food processor, this peach melba ice cream is a cinch to make. There’s no need to skin the peaches as you are meant to for the original dessert. The only slightly faffy thing needed is to sieve the raspberries. Bits of gritty raspberry seed would spoil the unctuousness of this smooth and creamy dessert. I used my Optimum Vac2 Air Vacuum Blender to whizz up both the raspberries and peaches. It’s a fabulous machine and if you want to find out what it can do please read my Vac2 review. As some of you may know, I like sugary things, but I don’t like them to be overly sweet or excessively bad for you. This is an adaptation of my standard no churn ice cream recipe and it contains a lot less sugar and condensed milk than others I’ve seen. Try it and let me know what you think. For a vegan version try substituting the condensed milk for condensed coconut milk and the double cream for whipped coconut cream. I haven’t tried this yet, but I’m going to. An all in one frozen take on the classic peach melba dessert. 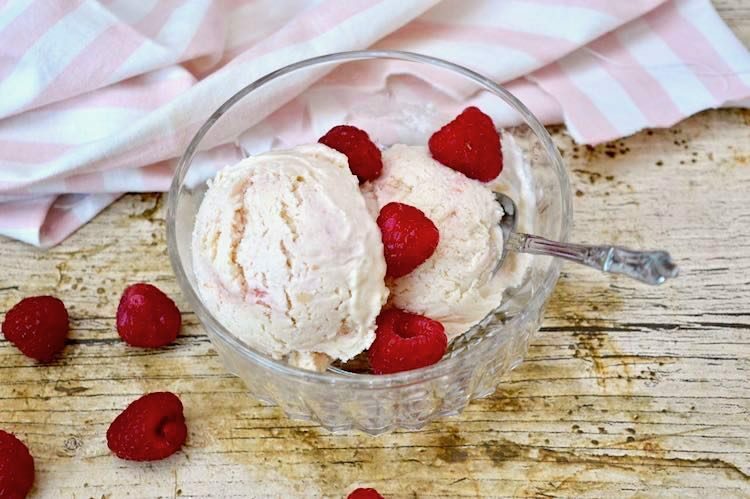 Sweet peaches combine with tart raspberries to make a smoothly sublime fruity ice cream. Whiz the raspberries up in a blender with the golden caster sugar for a few seconds until you have a sauce. I used my Optimum Vac2 Air Vacuum Blender. Sieve the sauce into a jug and discard the seeds. Place the peaches into the blender along with the amaretto. No need to wash the blender as long as no raspberry seeds remain. Whisk the cream with electric beaters until soft peaks form. Add the condensed milk and gently whisk together with the beaters until just combined. Fold in the peach puree until no streaks remain. Swirl the raspberry sauce through the mixture. Spoon into freezer-safe, suitably sized containers. I filled a 1 litre and a ¼ litre tub. Freeze for at least 6 hours and remove from the freezer ten minutes before serving. Will keep well in the freezer for at least three months. 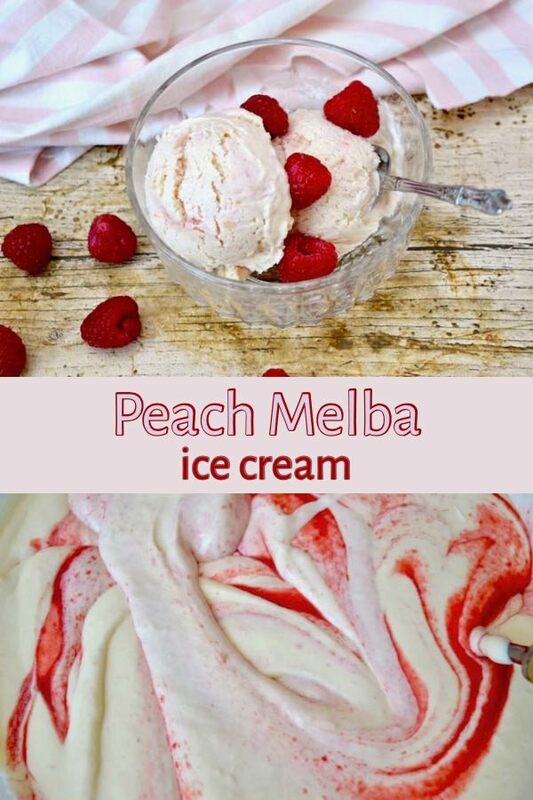 If you make this peach melba ice cream recipe, I’d love to hear about it or see a photo. For more nutritious and delicious recipes, follow me on Twitter, Facebook, Instagram or Pinterest. Froothie are currently offering a free gift worth £149 when you spend £299. an Optimum Sous Vide Silver Wand – just use the code FREESOUSVIDE. a Nutriforce Travel Blender – just use the code FREENUTRIFORCE. If you’d like to order an Optimum Vac2 Air Vacuum Power Blender, at time of writing it’s on offer at £399. Order it or any other Froothie appliance through either of these links and I can offer Tin and Thyme readers free P&P. Just add 2483 free ambassador delivery to the comment box when ordering. If you order by phone, just mention the code. The delivery charge will be credited back onto your card. If you’d rather not have the free gift, I can offer you an extra £20 discount off any other Froothie Blender. Use the code AMB20 when you order through my link. Froothie offers a five year warranty, which can be extended to ten years if desired (for an extra fee of course). There’s also a 30 day money back guarantee with free return postage costs. Peach Melba Ice Cream. PIN IT. That looks so good – loving the swirls! 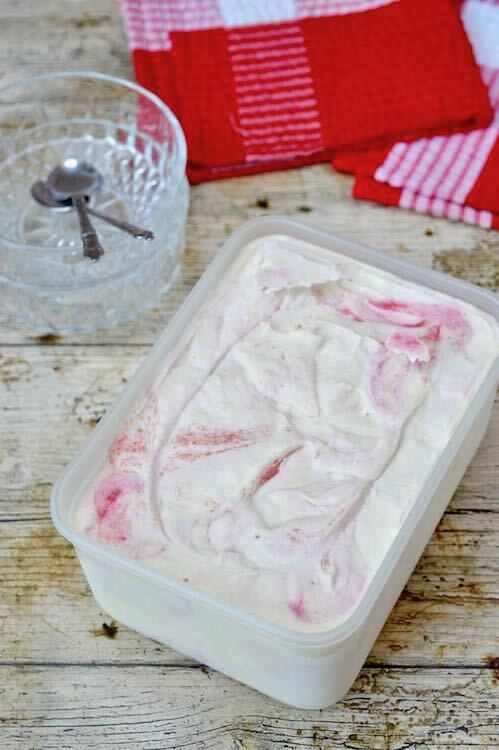 Can’t beat no churn ice cream & we’ve been making it almost every week over the summer! I’m with you on the no churn. I’ve made several batches this summer and explored several new flavours. Loved all your takes on it. So creamy and fruity at the same time! I love that it’s no churn too. Thanks Angie. No churn is just fantastic for hot weather when quick and easy meals are needed. I’ve made a lot of frozen desserts this summer and I think this is such a great idea – raspberries and peaches are a brilliant combination! I’m sure this is absolutely delicious and thanks for sharing with #CookOnceEatTwice! I’ve seen some of your ice-creams and they all look delicious Corina. It’s definitely THE dessert for this summer. Thanks Jacqui. I’m sort of wishing I could taste it now, but it’s sadly long gone. What I wouldn’t do for a huuuuuuuuuge faceplant worth bowl of this right now. Get what you’re saying. I made it for visitors, so it didn’t last very long at all. That looks gorgeous, I love the flavours and it looks so pretty. Thanks Kavey. Peaches and raspberries make for a most delicious ice cream. This summer is all about ice creams! What a delicious and smooth looking ice cream. That looks and sounds amazing Choclette, I am drooling at the thought of it. OH MY! I would definitely choose this if I was in an ice cream shop. Sharing it now. Thanks Jac. It’s a good one. Yesterday I made your Plum Amaretti ice cream. I made 50/50 Plum Amaretti and Rum and Raisin. Just halved it at the stage of adding the flavours. They are both lovely and NOT TOO SWEET. Your basic recipe is so easy and all manner of flavours can be added. I am so pleased to find this recipe – not so much condensed milk to over sweeten it. Will make the Peach Melba when we have made our way through these ones. Yummo!!!! Hi Mary. I’m so glad you like the recipe and thanks for letting me know. I generally try and use less sugar in my recipes than most as I don’t like things to be too unhealthy – mostly! All my family and friends who’ve tried it always seem to like it. Rum and raisin sounds totally lush. I think I need to make some. You know Ive never had a peach melba but the flavour combination of peaches and raspberries sounds like a winner to me. I’ve got people coming over for a BBQ next weekend and this would be the perfect dessert! BBQ dessert? Definitely. Good luck with the weather. Do you know, I’m not sure if I’ve had an actual peach melba either. Hmmm. might need to remedy that. This looks absolutely delicious. Love the flavours! Thanks Cat. Peach and raspberry is a bit of a classic, but also not that common a combination. Ooo this sounds yummy and looks perfect for summer! Thanks Kat. It’s a really good one, though to be honest most homemade ice-cream is pretty scrummy.